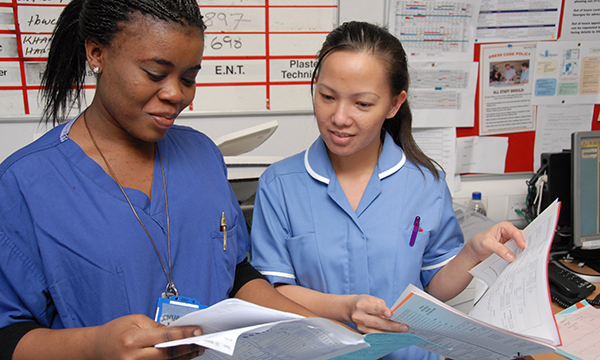 Handovers are an essential part of everyday nursing practice and a key part of ensuring patient safety, yet many happen at the end of a shift when staff are tired and waiting to go home. ‘We know from feedback that what makes nursing staff stressed and upset about their work patterns is always having to finish late, but often it’s because they want to give a good handover and they want to make sure they get it right,’ says RCN head of nursing practice Wendy Preston. According to the RCN’s safer staffing survey, published last year, 65% of the more than 30,000 staff who responded said they worked additional time. A quarter said they worked an extra hour or more on their most recent shift. She argues that handovers need the robust governance that is characteristic of other elements of nursing practice. Jane Bruton, clinical research manager in the Patient Experience Research Centre at Imperial College London and a nurse for almost 40 years, would also like to see a more structured approach to handovers. This should then be communicated to all the members of the multidisciplinary team and, crucially, to patients too, says Ms Bruton. ‘Our experience was that patients were often much clearer about what a ward round was and they were unsure about handovers. Some weren’t even aware of it happening,’ she says. 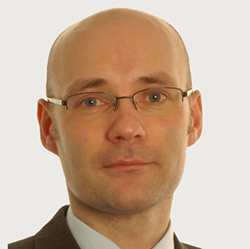 Work towards a shared model or understanding of what will be provided and what is expected during a handover, advises David Fitzpatrick, senior lecturer in health sciences at Stirling University. He suggests agreeing an appropriate mnemonic that everyone uses. ‘It’s not really that important which you choose, but that you’re all using it with a shared understanding,’ he says. Keep handovers succinct and avoid repetition. ‘They can go on too long, with routine information, such as age and diagnosis, handed over time after time,’ says Ms Bruton. ‘The risk is that you’ll run out of time to get to the things people don’t know.’ She suggests using handover sheets that include patient information. ‘And check whether the nurse already knows the patient,’ she says. This is used in a wide range of settings and by a variety of healthcare professionals, including nurses and doctors. Commonly used in managing trauma cases, often by paramedics handing over care to emergency department staff. Among the major frustrations for patients is when they are told something by one healthcare professional, but then another doesn’t have that information. ‘A nurse will say you’re not going to able to go home today, and the patient will say “but the doctor said I can”. It looks like you don’t know what’s happening,’ she says. ‘As a patient, you want to feel that staff know what’s going on, otherwise it’s unnerving.’ Regular checking in with each other throughout the day would help, she says. RELATED: Should nurse handovers take place at the patient’s bedside? The choice of language is another important issue. ‘If nurses are using language in front of the patient that isn’t easy to understand, it feels awkward,’ says Ms Bruton. ‘It sets up the concept of the patient being a child and this kind of paternalistic care isn’t appropriate. While some nurses worry that involving patients in handovers will lengthen the process, Ms Bruton believes that improving communication actually makes nurses’ working lives easier. ‘You aren’t correcting mistakes later on, which can be much more time-consuming than concentrating on getting it right from the beginning,’ she says. Handovers in the community present particular challenges. 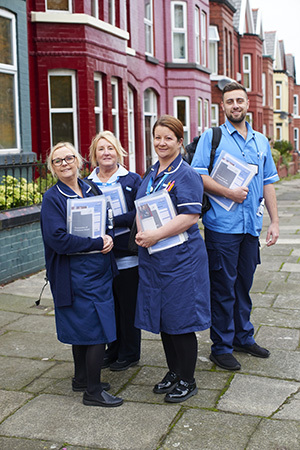 With their clinical handovers happening just once a week, a district nursing team in Merseyside has found additional daily ‘safety huddles’ invaluable in improving communication and delivering better patient care. ‘We designed a template as a way of trying to reduce harm to our patients,’ says district nurse team leader and Queen’s Nurse Jane Hulme, who works for Mersey Care NHS Foundation Trust. The trust provides specialist inpatient and community services for a catchment area of about 11 million people. In practice, staff meet for about 15 minutes each morning after their first calls. ‘It’s a snapshot of the previous day and a preview of what’s coming,’ says Ms Hulme. Each session begins with a list of prioritised patients and the care they need, tracking whether it’s been delivered in a timely way – for instance, people with insulin-dependent diabetes or those nearing the end of life. In one recent example, the team discovered that a patient who needed insulin twice daily had been missed from morning visits. A nurse was immediately dispatched to administer the medication, preventing an adverse incident. Jane Hulme and Michael Turner. Pressure ulcers can also be raised at the earliest stage, with reviews usually happening within 48 hours, leading to dramatic reductions in severity. Meanwhile, patients needing specialist help can be quickly referred to other teams. The team has also established a safety huddle handover for the evening service, sharing information about any patients who may ring for help. Since safety huddles began in summer 2016, they have been adopted by other teams in the area, including allied health professionals and specialist nursing teams, and in other parts of Liverpool. David Fitzpatrick, a senior lecturer in the health sciences faculty at the University of Stirling, has led two studies looking at communication in handovers between ambulance staff and those working in critical care and A&E. ‘Improving handovers is a top priority for the World Health Organization and we know that ineffective handovers can be associated with adverse incidents, including deaths,’ he says. Time was identified as another pressure, with almost half of ambulance staff who responded to a survey that formed part of the research reporting difficulties in finding enough time to prepare for handovers to other clinicians. Recording information physically was also challenging. While writing on the back of gloves is standard practice in the emergency care world, it raises a number of problems, says Dr Fitzpatrick, a former consultant paramedic who worked in the Scottish Ambulance Service for more than 20 years. ‘It can be easily smudged, raises potential data protection issues and may cause difficulties with infection control when you use the same pen but treat different patients,’ he says. To improve handovers, a number of essential components must come together, he says. ‘I look at handovers as part of a system, so you need multiple interventions rather than one, and it’s about how they are linked.’ This includes creating time and having a non-pressured environment, and using a shared mnemonic and documented evidence. Now the Scottish Ambulance Service has adopted a pre-alert and handover card, co-developed with an emergency department consultant to enhance communication in critical situations. The A6 double-sided, wipe clean, reusable card fits in the thigh pocket of ambulance staff uniforms. ‘Our small study found it was highly acceptable and well used,’ says Dr Fitzpatrick. Results also showed improvements in the delivery of eight out of 12 clinical variables. ‘It’s not the only solution to the problem, but it’s part of it,’ he says.